My name is Pete Hulme. I’m married with one son. Ten years as a teacher of literature, thirty years as a psychologist and more than thirty years as a Bahá’í (not consecutively! I’m only 73) have been part of a journey where I have been learning to use books and writing as two of the ways in which I can improve the maps I use to live by. I see human beings as meaning makers who are supremely valuable in themselves. This is in part what the best books show us. I am hoping to use this blog as a further tool in this process of exploration and the application of the resulting insights in the life we live. Sometimes prose simply won’t do the job so I resort to poetry as well. Hi, Pete! I came to your blog through Barney’s link today. You have been a Baha’i for approximately the same length of time as me. This “retirement years” and their meaning has been a puzzle and challenge for me, too. I’ve enjoyed your blog so much that I’ve subscribed! Thank you for your thoughts. Many thanks for the positive feedback, Pat. I’m still finding blogging exciting and rewarding in itself. But it’s good to hear that others enjoy it too. Kay, there’s something about blogging that suits my particular combination of strengths and weaknesses as a writer — I’m OK on sprints when the inspiration comes but the marathon?!? You speak somewhere of how your blog builds up a picture over time in fragments of a bigger picture. It’s a bit like that for me. If I can be a channel for something much bigger than I am it’s only in fits and starts. I’m so glad that my mirror seems just about polished enough for you to get some glimpses of the light from it when I write, but I always have to keep reminding myself the light is borrowed — it’s not mine. Hi Pete thanks for the link which brought me to this site. Will think about the “chaplaincy model” and let you have any thoughts that come to mind. Hi Peter, forgive me but I have had a more in depth look at your site and am very intrigued by your background. I used to be involved with Buddhism quite a bit but lost interest due to its ‘factionalism’. I see Robert Assagioli is mentioned here – I read a couple of his books when I was doing a course with the Huber School of Astrology back in the 90s, fascinating ideas. Sadly, I don’t have much involvement with psychosynthesis or astrology these days. And Baha’i, I’ve read about it but not to any depth, but I like the ‘syncretism’, although that may not be the correct word. I used to annoy the buddhists by talking about Jesus, how similar he and the Buddha were (to my mind and a lot of others). Your faith may go a long way in explaining that fact. I am very pleased to make your acquaintance, kind regards and my very good wishes. David. It’s good to hear from you, David. I feel we are grappling with similar issues in a way. My mind has been brought back to Psychosynthesis because a friend of mine has just started their training and is finding it fascinating, so I’ll probably have another look at my four books on the topic. Buddhism is always somewhere on my mind. Thank you for sharing your reflections. They are stirring and thought-provoking. Thank you for your thoughtful and engaging blog, which I stumbled across earlier this year and am now very much enjoying. . . This is excellent stuff. so excited to come across your blog and to get connected after quite some time. Dear Mohan, it’s great to hear from you. Hope all is well with you and your family. Warm regards, Pete. What a fascinating site. I can’t wait to dig into your archives. Wonderful writing and blog Pete! Many thanks for dropping in and for the encouraging comment. Would it be okay to include you in the links to this project in world Bahai blogs, and with your permission reblog some of your blogs there. https://aussiebahaiblog.wordpress.com/ Thanks, I have been reviewing Mavash Sabet’s poems today and will have my review up sometime in the next week or so. Many thanks, June, for your invitation to be included on the Aussie Blog site. I would be most happy for you to reblog posts from here. It is encouraging to feel that my gathering of the nectar from many different authors’ flowers is of value. I very much look forward to seeing your review of the poems. Hi! Thanks very much for following me, and for your words of encouragement. It’s very nice to meet you! Thanks Pete. Enjoying reading into your blog. Regards from Thom at the immortal jukebox. Thanks so much for stopping by my blog and liking my short bio page! I’m grateful to have found you–love your ideas and am looking forward to reading more! Many thanks for stopping by. Oh, and congratulations on becoming a contributor to the Huffington Post. I think it’s well-deserved – not many people manage to be so thoughtful and yet so accessible. Thank you so much! Your feedback means a lot to me, thank you! Many thanks, Hilary, for the encouraging feedback. I’m very glad that my blog helped you find Hollis’s biography. I’ve recently finished publishing a series of posts on poetry and am now ruminating on one of my other fixations, so it’ll be a bit of a drought as far as poetry in concerned for a few weeks yet! Hi, Bob. Many thanks for the encouraging feedback. I’m dashing about a bit at the moment and have also spectacularly destroyed my spectacles so I’ll get back to you about the review next week if that’s ok.
Hi, Marcello. Many thanks for visiting my blog and for the positive feedback. I look forward to hearing from you again. Thank you for a blog… This is the first Baha’i blog I like 100%! Many thanks for publishing a link to my blog. I wish I could take credit for the picture but, as I remember, this was on the BWC website many years ago. It doesn’t seem to be there anymore so I’m not quite sure how to attribute it for sure. 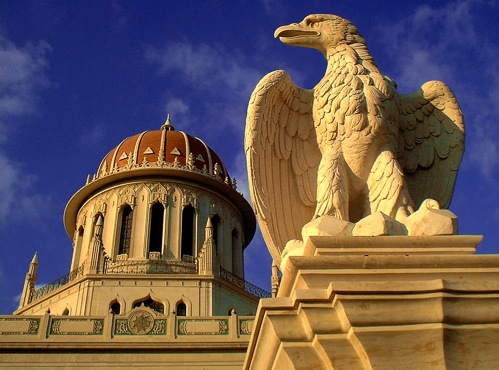 https://phulme.files.wordpress.com/2013/06/eagle-and-bab.jpg looks like the photography of Marco Abrar, who has produced both a book and a DVD with many beautiful scenes from the Baha’i Gardens. I read your blog on death. I am 72 and a recent widow. I stood beside my husband in a darkened hospital room and watched him take his last labored breath. He had no words because words had eluded him for many months. Alzheimers. His family and I rationalized that death was better than the alternative of enduring the inevitable painful withering of the brain. I miss him terribly and always will. In my mind he is not dead. Together we were committed to the Word. He always walked the walk. But not me. He watched as I took my first baby steps, and I joined him on the pathway. He was a little ahead of me. I have catching up to do. Death is not “death,” such an ugly and scary word. Can we change it to something more comforting so we won’t be so afraid? Thank you for sharing your experience of death and the story of your spiritual journey. It would take more than a comment to unpack what the Founder of the Bahá’í Faith, Bahá’u’lláh, meant when He transmitted the Word of God by saying: ‘I have made death a messenger of joy to thee. Wherefore dost thou grieve? I made the light to shed on thee its splendour. Why dost thou veil thyself therefrom?’The image that I use to help myself come to terms with the tests and tragedies of this world is that of the woven carpet. To those who see it from above the pattern is clear. But we, who are for the time being trapped below it, can only see the tangle of knots and dangling threads that seem to mean nothing and are certainly not beautiful. I believe that in death we join those who see the beauty of the pattern. The problem for me now is not the word death in itself, but the associations that I used to bring to it. Thanks, Barbara, for reminding me where I got the image of the carpet from. I was trying to explain that to someone the other day but couldn’t remember. Hadn’t got round to Googling for it yet! Thanks again for taking the time. I am a new blogger and appreciated your feedback.